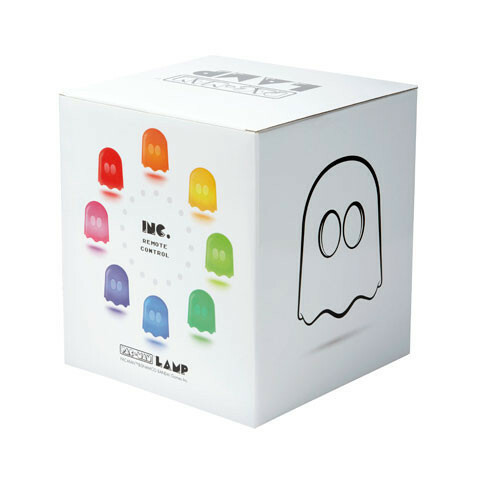 Having just purchased a Pac Man ghost LED lamp on the Black Friday sale I quickly saw an application for the ESP8266. Nothing novel, nothing that hadn’t been done 100 times before but something fun. The “anything it receives” means I can add functionbality on the Arduino without touching the firmware on the ESP8266. % mosquitto_pub -t "ghost/led" -m "#00ff00"
Now for the hard part, mounting the hardware inside the ghost. The ghost case is made up of three parts. 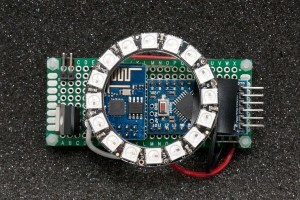 The dome, the base and a bottom plate where the electronics is attached. The bottom plate is attached to the base using screws and the base is glued to the dome. 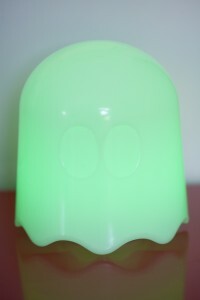 This leaves the screws on the inside meaning the ghost cannot be cracked open without causing permanent damage. Using a fine saw and a drill I removed the bottom plate, sanded the edges and rinsed the dome in water ro remove the plastic dust. The electronics is mounted on spacers on the bottom plate and I used silicone to reattach it to the dome. It stays in place and reopening should not be that hard. 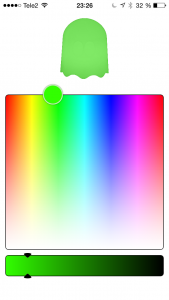 Controlling the ghost via the command line would not attract much venture capital so I set out to make an iPhone app for controlling the ghost. 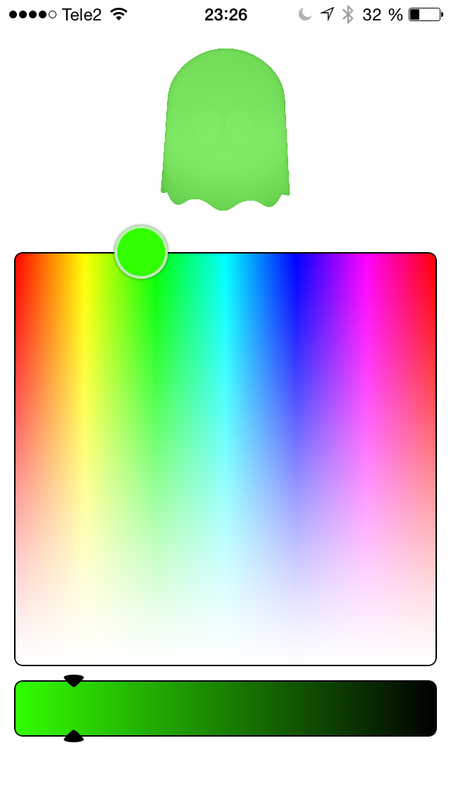 NKOColorPickerView and MQTTKit fit the bill and resulted in this neat little app I installed on my son’s iPad. He was somewhat impressed and have changed the ghost color about three times to date which was in line with my expectations. I do have other plans for the wifi ghost, but that’s for another post. In the time between finishing this hack and actually writing about it, Arduino on the ESP8266 has matured phenomenally so today I would skip the AVR. Actually I could replace all the hardware with the WifiPixels. 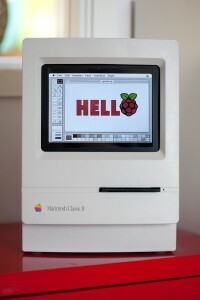 The Macintosh Classic is somewhat special to me as it was my first computer I used for other things than just games. Not suprisingly perhaps as the line games was somewhat limited although there where classics like Dark Castle, Apache Strike, Empire and Deja Vu. That aside, I have had a Mac Classic II in my study for years reminding me of where my career in IT started and it was time to pour some life into the old machine (click for hires images or see the gallery at the end). I had found this 8 inch TFT screen on eBay (update June 5th 2017, I have found a much cheaper variant on AliExpress that by the looks of it is identical) but as you can see the frame has no mounting support. 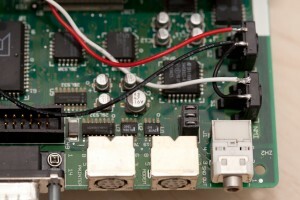 Adding the cabling and driver board with its adapter boards sums up to quite a mess. How do we mount this nicely inside the Classic? Plexiglass to the rescue! I cut out two sheets of plexiglass and placed the TFT screen between them. Glued piexes of plexiglass on the back sheet keeps the TFT screen from falling out. The different boards are placed on spacers mounted on the back side plexiglass sheet. The front and back sheets are held together usings screws. The final part was mounting the “screen module” inside the Classic. As I had thrown the old CRT screen out, it was only a matter of drilling the right holes in the plexiglass screen module and mount it the same manner the original screen was. 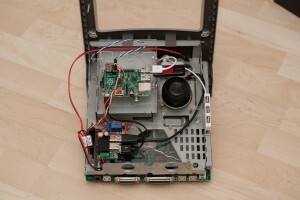 Next was the mounting of the Raspberry Pi. 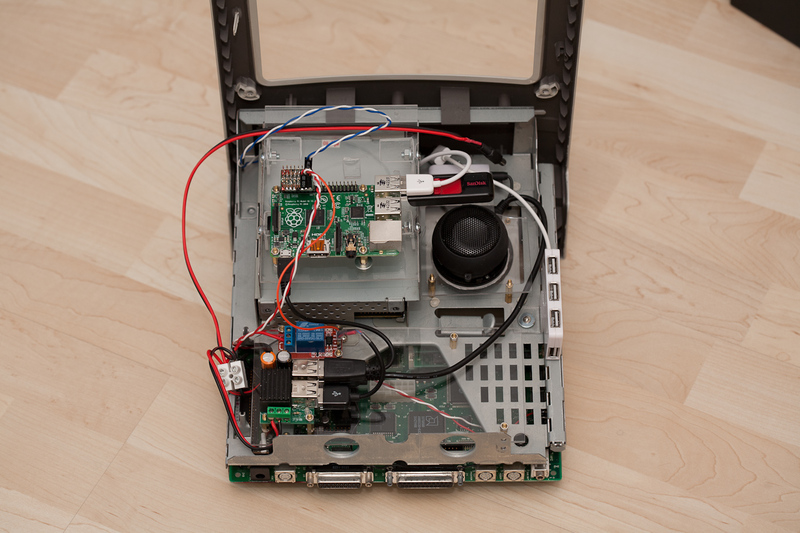 For this I reused the hard drive bay where I mounted a piece of plexiglass holding the Pi on spacers. I wanted to bring back the yawning like sound of a Macintosh ejecting a floppy disk. The idea was to have the Mac automatically eject an inserted floppy with a delay. So how did the old Macs detect the precense of a floppy disk? Is there a floppy present? Is is a single sided or double sided floppy? For this project, I only cared about switch #1. Deciding the floppy drive would never see real action again, I disconnected the switch from the rest of the floppy drive PCB by severing the traces. Soldering wires to the switch and attaching them to the Raspbery Pi GPIO header, the Pi could now sense the precense of a floppy disk. Next was the ejector motor. It runs on 12V (as the TFT screen) and I purchased a relay on eBay that the Raspberry Pi could control. On the left hand side of the old compact Macs was the programmer’s key and the reset button. The former would enter the debugger built into the computer. I wanted to connect these to the Raspberry Pi so once again I severed some traces. On the the motherboard this time. 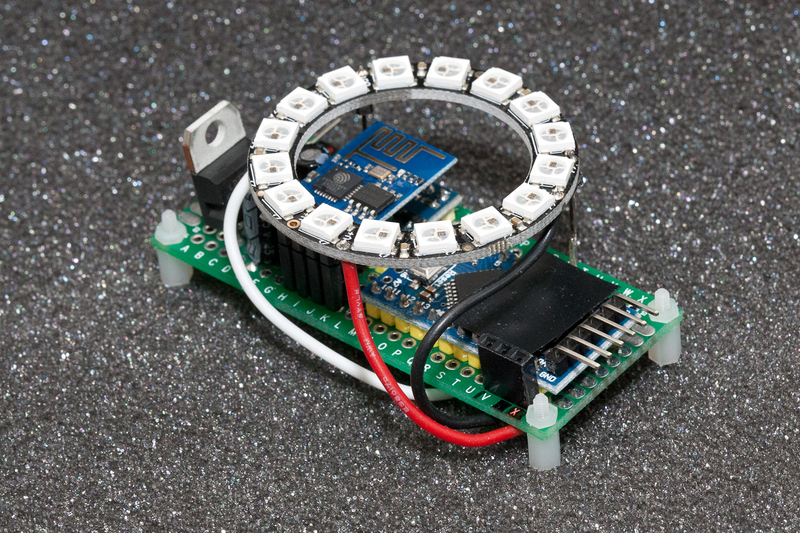 For power, I purchased a 12V to 5V converter with quad USB output on eBay. 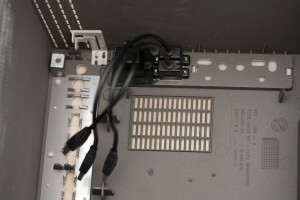 This together with the relay was mounted on a sheet of plexiglass that was mounted on spacers in the back of the computer. The speaker was mounted in a large hole i drilled in (you guessed it) a piece of plexiglass mounted on (guessed it again?) spacers. As the sound quality on the original Raspberry Pi was quite poor I added a USB sound card (also from eBay). 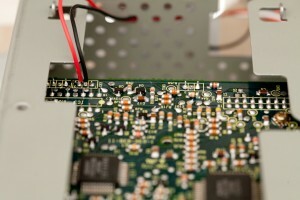 I desoldered the microphone connector on the Mac’s mother board and replaced it with a power jack that I connected to the 12V/5V converter. 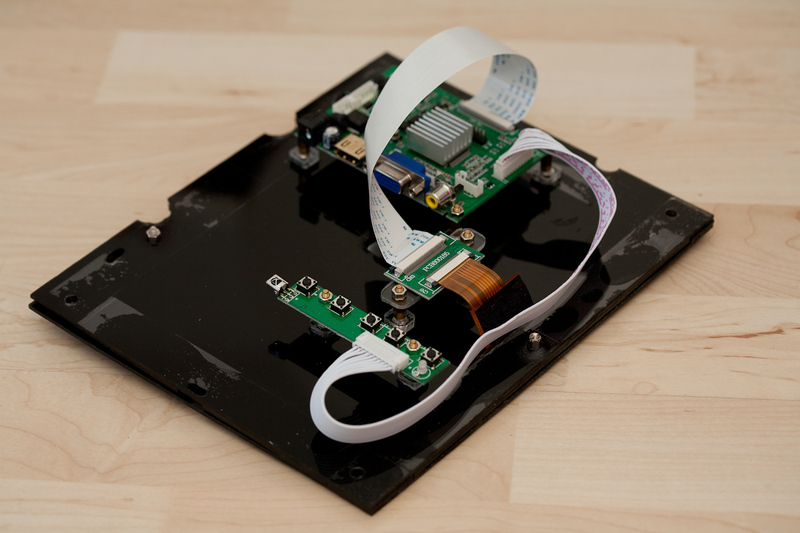 An old Western Digital USB disk power supply provies the 12V needed. Last but not least, I added two external USB ports and an ethernet port. Both use passthrough cables found on eBay (search for “USB 2.0 A panel mount extension cable 25cm” and “ethernet panel mount extension cable 25cm“. They are mounted on the last piece of plexiglass that is glued to the inside of the case. 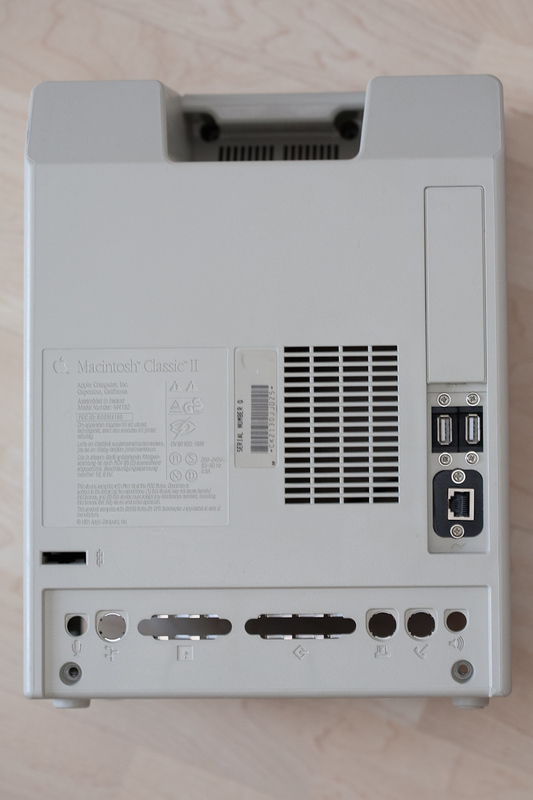 I reused the holes where the original 220V power cable connector and power switch where located. A simple python script checks the programmer’s key, the reset button and the floppy detection switch and controls the eject motor. Pressing one of the keys will play the lovely old Macintosh Quadra chime. 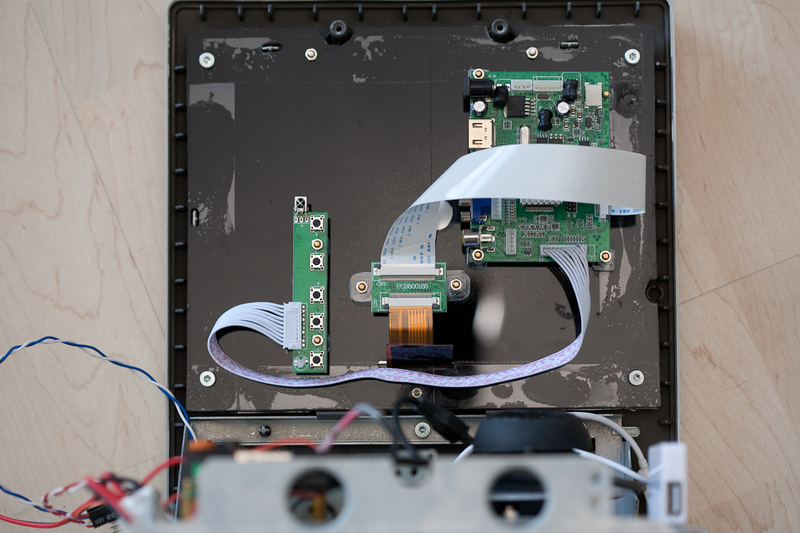 A long press will shut the Raspberry Pi down. I am quite pleased with how this mod turned out. There is nothing loose inside the case that can fall over, get tangled up and cause shorts. By accident, the Mac was drop tested from a height of one meter. It survived, nothing came loose. I have some future plans for HW modifications including a touch screen, replacing the clicking mechanical relay with a transistor and I should add a fuse to the 12V line for safety. Most of all, I need to add software to make the old Classic actually do something. But that is for a later post. Update 26th of June 2016, the python script running the show is now on Github. Update 5th of June 2017, added AliExpress link to cheaper display and eBay links to USB/ethernet passthrough cables.